As I turned a corner in the road and caught sight of the ski slope, my spirits sank. This was not going to be easy. Running with the Devil is a timed race that takes place on a 3-mile loop at the Mountain Creek Ski Resort in New Jersey. Each loop takes you up 1,100 feet to the top of a ski slope, and then back down again. The average grade is 14%, but in some sections it approaches 30%. The goal is to do as many loops as you can within a 12-hour time-limit. I had been looking forward to this race for many reasons, including not only the challenge of battling the mountain and the joy of being outdoors on a summer day, but also because my sixteen-year old son had been reading up on philosophy and had asked me recently, what did I think about free will? I replied that surely anyone who would run up and down a mountain for twelve hours is exercising free will — why else would they do that? 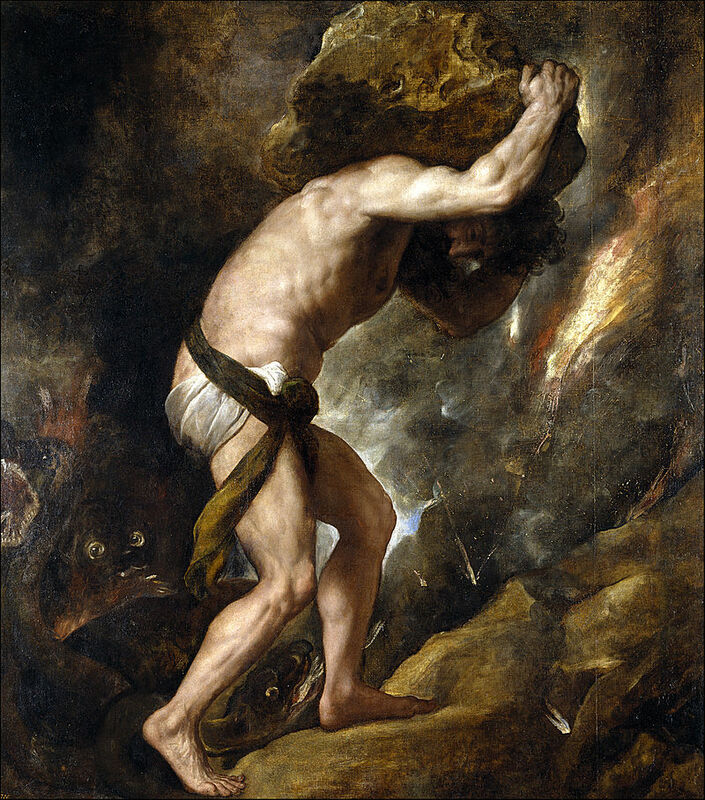 But then I remembered the story of Sisyphus, founder and king of Ephyra (now called Corinth), who was punished for irreverence and trickery by being forced to push a rock up a mountain, only to have it roll down to the base, compelling him to push it back up again and again, doomed to an eternity of useless effort and perpetual frustration. Running with the Devil would be in some ways a taste of his experience. At the start I headed out at a slow pace, glancing upwards at the cloudy sky, and taking one step at a time on the steepest sections. It was a good thing I didn’t have to push a rock up the hill: climbing the steep slope was stressful enough with only my own body weight to propel. 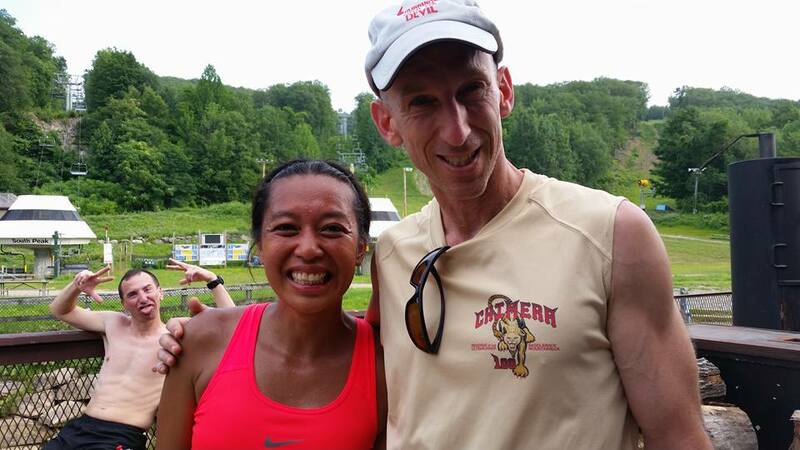 I hung out in the back of the pack with my friend Elaine Acosta, who was nursing a strained calf. It was fun talking with her, but otherwise the first couple of laps were disheartening, especially when I found myself just about in last place. It started to rain lightly, and then it poured. Soaked, I toiled away. As I plodded along, I reflected on Sisyphus’ story. He was said to have been greedy and deceitful, ruling Ephyra with an iron fist, killing guests and travelers on whim, seducing women for political advantage, and betraying the secrets of the gods for personal gain. Summoned to the underworld, Sisyphus tricked Death, locked the spirit up in its own chains, and returned to Corinth. Eventually he died, but even then he talked Persephone into letting him escape from the underworld. In due course he was dragged back and set to work on his perpetual task. You could read this myth as a morality story, and indeed the famous painting of Sisyphus by the 16th-century Italian painter Titian was commissioned as a warning to those who might defy the Holy Roman Emperor. You could also read the fable as appealing to Greek commoners, who might well relish seeing a crafty aristocrat doing hard physical labor for a change. By late morning, the sun came out and it began to get warm. Half-way up the mountain, there was a spot on the ridge with expansive views to the north and south and a cool breeze blowing across. The course leveled off and wound briefly through a forest, before ascending the final slope through a field of waist-high wildflowers, including milkweed, daisies, and purple musk thistle (Carduus nutans). There was a flash of yellow, and a pair of American Goldfinches darted by, twittering and warbling. At the top of the mountain, the organizers had stacked jugs of water. Since I wasn’t carrying a water bottle, I stopped and gulped from the communal cup. In 1942, the French writer and philosopher Albert Camus published a book entitled The Myth of Sisyphus, in which he railed against man’s futile search for meaning in a world that is purposeless and absurd. Camus presents Sisyphus’s ceaseless toil as a metaphor for modern lives wasted at futile jobs in factories and offices. I struggled to understand why his viewpoint was so downbeat, but then I recalled that Camus was living at the time under Nazi occupation. Confronted with the meaningless of life, Camus urges revolt and passion. He would have us acknowledge the absurdity of it all, but then go on to live life to its fullest, and ultimately achieve a state of contented acceptance with our fate. For the “Absurd Hero,” it is not hope, but work that fulfills. The struggle towards the heights is enough to fill man’s heart. One must imagine Sisyphus happy. I had imagined Running with the Devil as a Sisyphusian experience and a chance to achieve the state of mind of contented acceptance. People who are true masters of ultra-running, those who compete in multi-day races or races that last thousands of miles, tell me that the secret is to recognize “it’s all in your head.” And then you just keep moving forward. But that wasn’t to be my experience today. After my slow start, I started feeling a little better and began to pass people (an experience unavailable to Sisyphus in his solitary labors). At one point, I looked up and saw three runners stacked above me on the slope. Coincidentally, each was shirtless and wearing black shorts. Passing each one in turn cheered me greatly and helped me maintained a steady pace, as I progressed around the 3-mile loop and whittled away the remaining time. Indeed, things were going quite well until around three in the afternoon, when nine hours of relentless climbing and descending began to take their toll. My legs started to cramp, an indication that I had pushed my muscles well beyond their normal capacity. Also, I was getting dehydrated and had barely eaten all day. I needed to stop and refuel. Time passed. On the next lap, I was flying downhill, when I hit a rock, legs locked up, and my sunglasses were flung into the grass. I cursed in pain and frustration as I staggered around searching for them. When I finally reached the bottom, there was time for one final lap. I limped around the course, wondering how I would fold my cramping legs into the car and make it home. While it’s fun to run when you’re fresh, the greatest part of an ultramarathon is the finish, the point where you achieve your goal and finally have a chance to rest. The parallel to Sisyphus doesn’t work, because for him there is no finish. As I drove home, legs still throbbing, I decided that Camus’ recipe for the Absurd Hero was not for me. Rather than reconciling myself to the pointlessness of life, I’d rather keep looking for goals, keep trying to move forward, even if it wasn’t by much. While Sisyphus will keep circling his mountain for ever, I will slow down and grind to a halt one day, whether because the mountain wears me down, or because of fatigue, injury, or eventually old age. So I might as well do what I can while there’s time. During the twelve hours, I covered thirteen laps or 39 miles, which included a cumulative 14,300 feet of climbing and descending. I came in 2nd place male and third overall, right behind my friend Elaine. She’s headed off in a few weeks to race the UTMB, a 100-mile ultra-marathon that circles around Mt. Blanc, and I predict she will do really well.